A Pardon for "The Breaker"? "The Age" newspaper is reporting today that a push is underway to obtain a pardon for Harry "Breaker" Morant. Morant, along with Peter Handcock and George Ramsdale Witton, were court-martialled and convicted, in January 1902, of the murder of a number of prisoners of war during the Boer War in South Africa. Morant and Handcock were executed by firing squad on 27th February 1902. Witton's sentence was commuted and later overthrown. 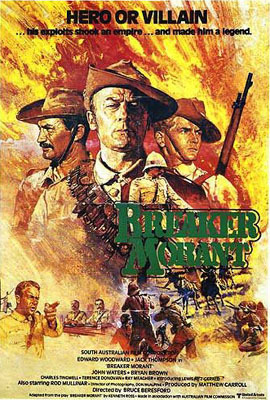 In 1979 Kenneth Ross wrote a play, "Breaker Morant", based on the incident. The play was later adapted for the screen by Bruce Beresford with Edward Woodward as Morant, and Bryan Brown as Handcock. 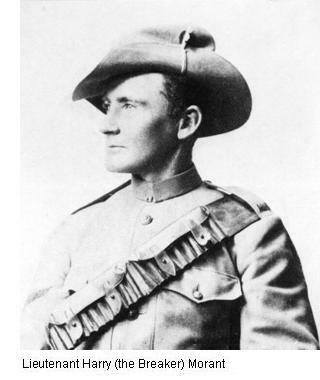 As well as being a soldier and horseman, Morant was also a poet, of reasonable quality, in the bush ballad style popular in Australia in the late 19th century. The bulk of his poems (about 60 in all) were published in The Bulletin. These poems were collected and published in one volume in 1980. The most poignant of these being "Butchered to make a Dutchman's Holiday", written while Morant was waiting for his death sentence to be carried out. This latest push for a posthumous pardon is based on a call for a re-examination of the trial proceedings, with the argument being that Morant and his co-accused were not allowed a reasonable period to prepare their case and were not allowed to call certain witnesses in their defence. The release of Witton in 1904 after a review of the case would tend to lend some credence to the new arguments. There seems to be little doubt that Morant did commit the acts of which he was accused. The question that remains is whether or not he was just "following orders" from the British High Command - though this was later dismissed as a legitimate defence during the Nuremberg Trials following World War II - and whether he was executed in order to ensure that the incident and the policies around it would be "hushed up" and forgotten. It is interesting to note that Morant and Handcock remain the only two Australians ever convicted of war crimes. "it is interesting to note that Morant and Handcock remain the only two Australians ever convicted of war crimes"... which is not to say that there were no war crimes committed by Australians. I personally know of one, when in WW2 my FIL was sent to the brig for refusing an order, an order to fire on the enemy in the water, after their ship was sunk. Maybe one day this will be investigated and the truth will come out, though the perpetrators must all be very old by now. This page contains a single entry by Perry Middlemiss published on October 19, 2009 2:21 PM. The Grocer's Apostrophe - "Reserve's" was the previous entry in this blog. Australian Bookcovers #182 - Death Deal by Garry Disher is the next entry in this blog.